It’s not over yet, but summer has definitely taken a turn for the chilly this week! Grab a warm beverage and keep comfortable in some of our greatest pieces of the season, with many 25% off! It’s HOT outside, just in case you hadn’t already noticed… days like these it’s pretty much impossible to be comfortable outside, but here’s a little Fresh Collective outfit that is about as cool and breezy as can be (BONUS – all of these items are now 25% off as part of our Sweet Summer Sale)! Be sure to use SPF and drink lots of water! Stay cool, friends! It’s time to get outside! Picnics, fireworks, park dates, play dates, street fests – it’s all happening! Summertime in the city is in full swing, and with it, the need for simple, practical, wearable pieces. Fresh Collective is known for it’s overwhelming supply of gorgeous dresses, but you may be surprised to find that we have an amazing selection of locally designed separates, perfect for a fun and active summer! It’s the time of the season for loving… date nights, summer getaways and WEDDINGS. In fact, this very weekend is one of the busiest weekends for weddings in the city of Toronto! Fresh Collective is spilling over with perfect dresses, shoes and accessories for any romance-filled summer occasion. Whether you’re knocking your partner off their feet on date night, dancing the night away at your best friend’s wedding OR bestowing a sweet thank-you gift on YOUR bridesmaids, we’ve got you covered. Check out our Fresh Wedding Pinterest board for even more fun wedding ideas! Come to the exciting, eclectic neighborhood of Roncesvalles Village on Saturday June 15th for annual local music, arts and culture festival, Roncy Rocks! 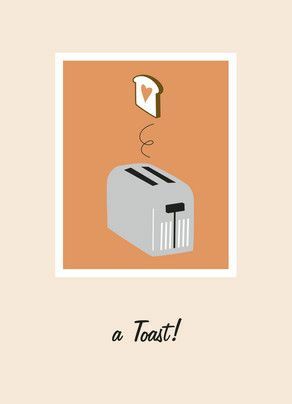 Fresh Collective will be hosting a fabulous Sidewalk Sale between 10am-8pm of the classic Toronto clothing line Fresh Baked Goods. 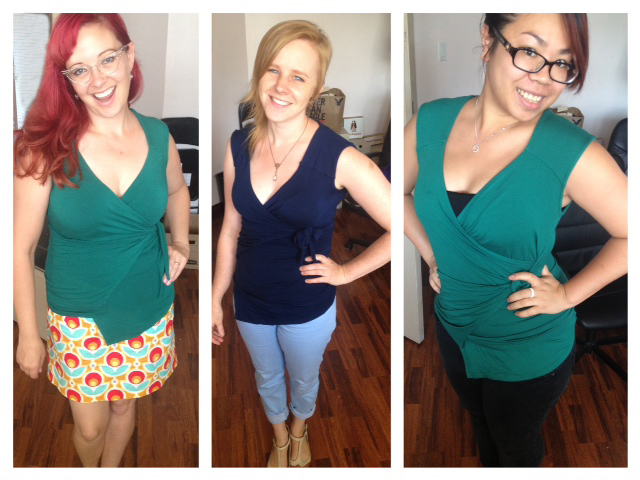 Come snag sweet deals on your favourite dresses, skirts and tops at this blowout sale! Stop by for an iced herbal tea and meet and greet with two of our talented designers, Kat Shura, creator of Curious Oddities, a line of vintage styled jewellery and Yasmine Louis, renowned silk screen artist behind the one of a kind collection of Toronto cityscapes silk screened on quality tees. We’ll keep you entertained as you shop with a live Cello performance by Sarah Steeves at 3pm. 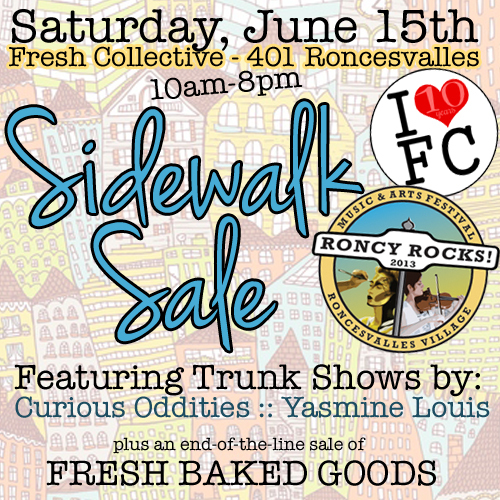 If that’s not enough, we’ll also be drawing for our Roncy Rocks prize pack which includes a Fresh Baked Goods Dress, A Curious Oddities pocket watch (perfect gift for Dad! 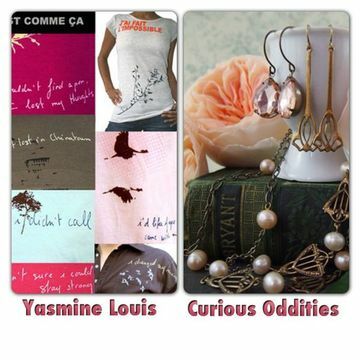 ), and a Yasmine Louis Tee! The sun is back after yesterday’s gloomy weather. Rejoice! Time to show of those gams – the popular Brenda Beddome printed pants also come in an adorable bermuda-style short ($126). Pair the shorts with our best-selling “Kongo Wrap” top from Melow (available in green, navy, black and black/white stripes – $115) and a flirty pair of “Cherry” sandals from Miz Mooz ($125). Add a simple long pendant necklace from Curious Oddities and a bright polish on your fingers and toes and you’re set for a summer day in the sun! Whether you’re the Mom being celebrated or you’re spending time with yours, this outfit is sure to have you feeling and looking wonderful! The Rita Di Cesare dress is made from a soft jersey that just floats off the figure. Pair it with this fun pair of Miz Mooz pumps and a complimentary statement necklace from Sugar Rush‘s Summer Romance collection and enjoy this beautiful weekend! It’s getting warmer and warmer out there – finally time to ditch the winter neutrals and break out of those blahs in bold patterns and bright colours! This outfit does just that with a pixel-patterned top from Mandala Design, cropped spring Yoga Jeans (our fave) in aquamarine, and a pop of colour for your ears from Sugar Rush. Anchor the look with a cute pair of black pumps from Miz Mooz and you’re set to celebrate the season!